There are two ways to edit a data source. You can manually edit the columns/rows directly from the web platform, or upload a spreadsheet in either CSV or Excel format. 1. Using the menu on the left side of the screen select Connected Data, and choose Data Sources from the drop down. Navigate through the list to the desired data source. 2. Hover over the data source and select 'Rows'. 3. 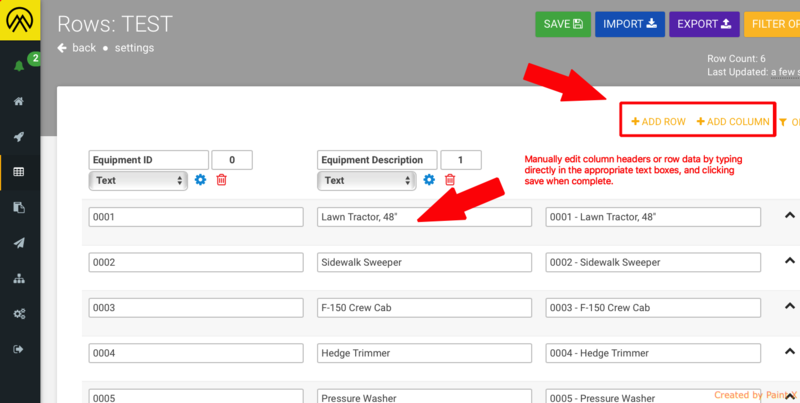 Once the data source is opened, you will be able to +Add Row, +Add Column or even modify existing row/column data by simply clicking the appropriate text box and making changes. Always ensure to click 'SAVE'. Many data sources will be locked from the manual editing due to their size. The system does this to prevent accidental changes in larger inventory data sources that cannot be fully displayed in the web platform. Note: If you upload a CSV file, make sure the first row is a header row containing your column names. 1. To begin the editing process on larger data sources, you must first export the file from the web platform. Follow the steps above to access the data source and then click 'EXPORT'. 2. Follow the on screen instructions to download the data source from the web platform. 3. The file will generally save, in .xlsx format, into the Downloads folder on your computer. Once the download is complete, open the document in a spreadsheet program like Excel, and perform any necessary edits through it. Save your edits using a name you will recognize. You will need to upload that same file back into the web platform. 4. 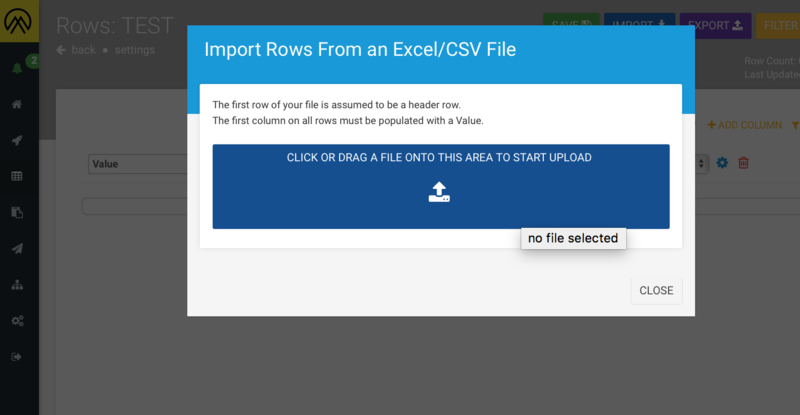 From the appropriate data source screen in the web platform, click 'IMPORT' in the top right corner, and follow the on screen instructions to upload your edited spreadsheet. The data source has now been successfully edited and uploaded back to the web platform. Always ensure to click 'SAVE'. 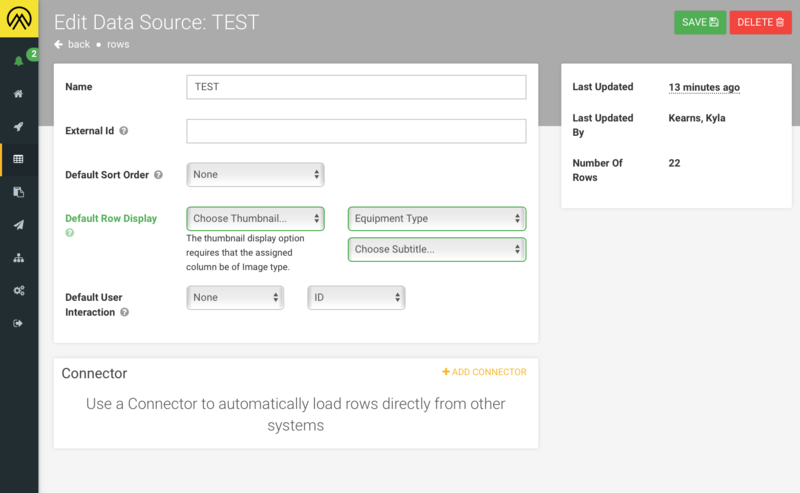 Data sources have some detailed configuration options that can be changed to suit your requirements. To access these hover over a data source and click 'Settings'. External ID: is useful for programmatically referencing that data source. It can't contain any spaces or special symbols, other than an underscore. Default Sort Order: row data will automatically sort alphabetically based on the selected column, this can be changed, or turned off here. 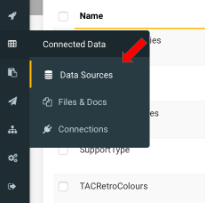 Add Connector: additional actions can be attached to data sources that will pull information from several external sources, updating regularly. 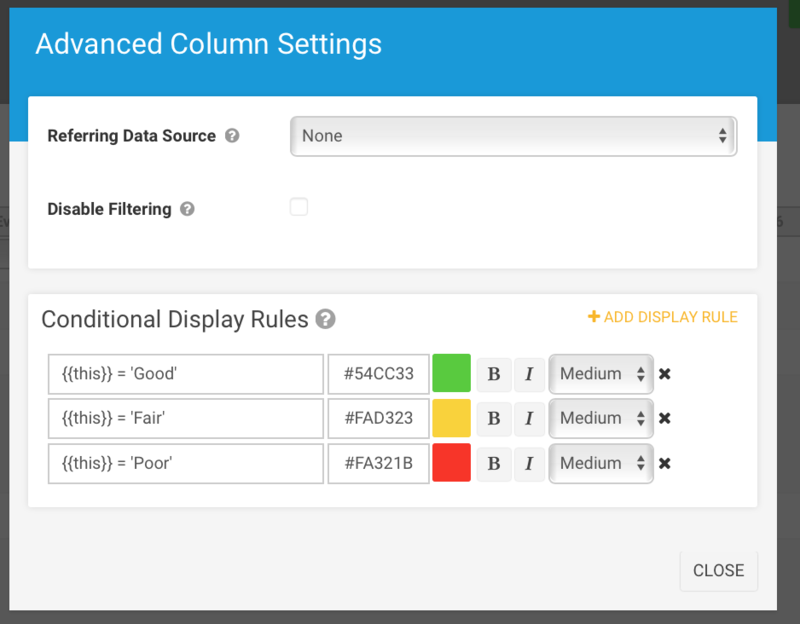 Rules can also be set for each column in a data source. This is useful if there are conditions that you wish to display differently. For example, in a sign inventory, if you want to see all signs with a rating of 'Good' as green, 'Fair' as yellow, or 'Poor' as red, you would set those rules in the settings for the Overall Condition column. Note: Column and data source settings can be edited without needing to export larger data sources. The first column must contain unique values as it will be used as the key/identifier for the row. The second column must contain a value and will default to being the displayable label text for each row. Editing a data source is a specialized activity as it will modify the way the screen attached to it behaves. Always edit with caution, double check that edits are necessary, and save your work regularly. Deleting a data source is available from the data source settings page. It's only possible when the data source is not yet connected to any screens.